Zimmer Twins is a new site I discovered courtesy of Joao Alves, whom I follow on Twitter. 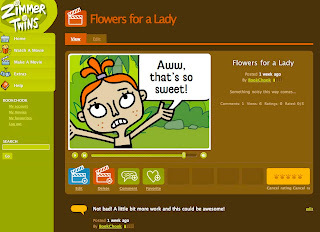 Here kids can tell stories using an online editor which generates a little movie. Watch a starter (a short animation that ends with a cliff-hanger). Create their own ending to the story by writing dialog for the characters and putting scenes together. Save their work on the website for other kids to watch, rate and comment on. Watch and rate movies made by other kids. It's a nice simple interface. The beginning video explains the process well. I think the easiest way for a child to begin after that would be to choose a little movie starter. This is just like a writing prompt, a way into a story to get kids going. Then they can build the rest of the story, using four tabs: text in speech bubbles, snippets of character movement, emotion and special effects. Once you click an option (from the four tabs), it appears in your timeline, and on your editing screen, where you can add text to it. One real strength is how user-friendly the editor is. You don't have to save as you go, things stay put in the timeline until you delete them. If you want to check how your story is developing, you drag the slider back to the start and click play. If you decide you want to insert something, you can drag and drop it to its new place on your timeline. Once you're happy with the result, you can save your movie (if you've registered on the site) and share the url with your friends. Here is one I made about a rockin' cat, and one about the same characters in the jungle. The site has an emphasis on courtesy and netiquette, which I like. For instance, kids can only make comments on other movies from a group of options, so put-downs don't get a look-in. Children must have parental permission too, and it looks like the site is determined to keep it appropriate for a young audience. The Zimmer Twins is a US TV show. That restricts the characters to three, and of course you are limited in actions, emotions etc to what the editor offers. But I think children will find it as engaging as I did to solve the challenge of how to tell a story using this format. This is another great way to develop literacy skills while creating stories and having fun. A Book Chook win-win! For $3.95 per month, or $19.95 for six-months, VIPs can write their own comments, access exclusive animation clips to create their movies, make customizable profile pages and review movies by other members. VIP members take part in a safe, moderated online community and support the Zimmer Twins! By purchasing VIP memberships, parents help the site stay commercial-free. Kids can still become a member for free. As a free member they can make and save as many movies as they want, but their movies will not be entered into moderation so they won't become visible to the public. The company is also planning to release an education membership. :-D Woot, this is an cool website, now i know why my friends want my kid to play this. It aint bad, which also builds up my kids skills in which they think. Thanks for letting me know. You're welcome, flyingteachers, I hope you both enjoy it!